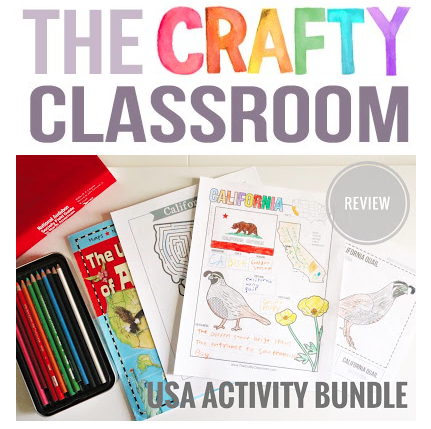 If you are looking for USA notebooking pages to compliment your geography studies this year, The Crafty Classroom has a beautiful set in their USA Activity Bundle. The U.S.A. Activity Pack which contains activity pages for each of the 50 states. Your child can color the state flag, find a state on the map and color it in, and write the state's abbreviation, nickname, bird, flower, and other interesting facts about the state. This pack also includes two games: Roll Across America and Bingo USA. The U.S.A. State Bird Art Cards which is a set of state birds to color, write in facts, and play memory games with. The U.S.A. 50 State Mazes which is a set of mazes for each state for a fun activity. These activity packs are like little activity books. They would be perfect for an afternoon activity when it's hot out, to supplement your study of U.S. geography, or on long car trips while traveling especially if you plan to travel through several states. To use these, you need to be able to download the PDF files to your computer and print them. To use the activity and bird pages, you will need a children's atlas, a bird field guide, and colored pencils or crayons. If you will be traveling, I would suggest you have them spiral bound or three-hole punched and placed in a notebook. If you print single sided, your child could paste in souvenirs from your travels on the back. I used these with all three of my younger kiddos when it was too hot to be outside. I started by having each kid choose two states to complete, and then I printed the state activity page, the state bird, and the maze for each state. We used The United States of America: A State By State Guide, a suggested resource to complete the pages because it is kid friendly, full-color, and interesting, but you could use any children's atlas to complete the pages or the free resource suggested on the product page. I thought this resource was realistic, pretty, and worth the purchase. Eliana and Malachi are 10 and 12, so these pages were easy for them. Bo, who is 6, thought they were hard. It took him several sittings to color, and he didn't write all the facts in. These really don't require too much writing, but my boys typically don't like to write until they are seven. There are three primary lines to write information on them, so I'm guessing these are geared more for early elementary. He colored the bird page, so I didn't make him color the quail twice, much to his relief. It took several sittings to get him this far as it was. He never thinks it's too hot to be outside as long as there is water to play in, so I had to ask him to come in to work on them a couple times. The mazes were fun and not too easy nor too hard. Bo only needed a little help with his first maze. The other two enjoyed doing them. I sat and colored with the kids. No one had picked Wyoming which is the state we live in, so I chose it for myself. It was fun to color and also to set an example of what a completed page might look like. There is a suggested book for learning about birds, but I didn't see it when I ordered the book for the states, so I just showed them how to look up their state bird in a field guide for North American birds. Then, I modeled writing a few fun or interesting facts about the Wyoming state bird, the Western Meadowlark. Just by coloring the markings, I familiarized myself with the bird and have been checking out every black and yellow bird I see for their unique markings. I read more information about the bird from the field guide and wrote a few things down. The kids mostly just wanted to color and not do school things right now, but if this were in the middle of the school year, and we were doing a unit study on birds, this would be a great resource. You could make flash cards or play memory games with the State Bird Art Cards. I saved the Bingo USA and Roll Across America games for last. These are printable card stock games found in the back of the USA Activity Pack. This game has 6 different bingo boards, but it requires a "call sheet" that is not included in the activity pack. It does include a list of all the states on a map, without the capitals, but the print is very fine and hard to read without my reading glasses. So, I printed two sets of bingo cards, cut out one for calling, and put them in a container to pull out one at a time. This way, the kids can play on their own. All three kids played in the kitchen by themselves while I cooked dinner one day. After they hit their first bingo, I pulled out beans to use as markers so they could continue to play until blackout. They all said Bingo USA was fun to play. I like that it is teaching them the shape of each state. I have a curriculum sitting on my shelf to learn how to draw each state, so this would be a fun resource to go along with it, if we ever decide to do it. The next game is Roll Across America. To set up this game, I printed the game board on cardstock and glued it onto another piece of cardstock for durability (instead of laminating as suggested). To play this game, you roll the die, move your guy, and name the state (and capital if you can). Malachi and Bo played the Roll Across the America game, and Bo ended up in tears over this game. He kept saying that Malachi was cheating, but what he really meant is that it wasn't a fair match. Malachi knows all his states and capitals and is in the 7th grade. Bo is 1st grade this coming year, and I've not required him to know them all yet. He got upset several times for missing a turn or having to go back, but he kept trying. It was motivating for them both to race to the finish line. When I did a 50 state unit study with my older boys way back in the day, I made a simple notebooking page for them to learn about each state. I had them write the state's basic facts and draw a picture to represent the state. But, these would have been more fun, I'm sure. In fact, I would have used them last year for a state study that was scheduled in our curriculum. I couldn't find a state-by-state product that appealed to me at the time, but these ones do, and you can't complain about the price. The bundle sells for $15, but you can buy individual packs for $5 each. I have followed The Crafty Classroom blog and sister sites since I first started blogging and have always found Valeries's lapbooks, projects, tutorials, and crafts to be very nice and high in quality. I've always liked her work, and her USA Activity Bundle does not disappoint. It may not have been the best timing to use in our homeschool right now, but if I was doing a state study, I would consider these. Since the bird is on the state page from the U.S.A. Activity Pack, I would probably just buy that pack because I think I would get the most use out of it, but I'd probably want them all. The Crafty Classroom offers other notebooking pages, such as the Alphabet Curriculum Notebook, Learn to R.E.A.D. Curriculum Notebook, and more, so be sure to check out my Crew mates reviews by clicking below. Connect with The Crafty Classroom on: Facebook, Twitter, Pinterest, or Instagram.